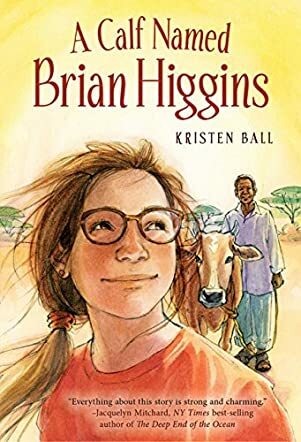 A Calf Named Brian Higgins: An Adventure in Rural Kenya by Kristen Ball is the story of American teenager Hannah Higgins who accompanies her mom on a three-week trip to Kenya. Their goal is to help Hannah's Uncle Brian with his work in Sauri, a small rural village located on the western edge of Kenya. The story is about evolving family relationships and Hannah's growth as she adapts to a different culture, but the plot really serves to provide a skeleton for the true meat of the novel, which is a richly drawn picture of daily life in rural Kenya. Hannah's reactions are very believable as she experiences a world where tap water might or might not turn on, cell phone apps don't work and there is no corner store. She learns about the fragility of life in a place where tragic accidents happen because of insufficient roads, and whether or not a person dies from malaria depends on whether or not the clinic has medicine that day. A Calf Named Brian Higgins is a very moving story. It caught my eye because I visited Kenya years ago, and the vivid descriptions brought back many memories. The work is fiction, but the events have a true-to-life feel because many of them are based on the experiences of the author, Kristen Ball, who did a top-notch job of adapting her observations and experiences into a novel. The most meaningful theme for me was the message Hannah hears: people help each other by taking only what they need, nothing more. The word “poverty” doesn't seem adequate to describe the lack of resources here – school lunch is prepared and served by the children, who eat it with their hands, three kids to a bowl. Yet the people enjoy a richness in a community that the more developed world can barely imagine. I wish every American teenager had an opportunity to experience life in a place like Sauri, but if not, I wish they would read this book.